Do you know which is the most popular haircut in America? Neither the undercut, nor the fade, and not any of the hairstyles which you would link with the American population, you will be surprised to know that the most requested hairstyle in America is the short haircut. This has been revealed after a survey of over 500 barbers who have told the fact from their experience. The short hairstyle seems to match every type of face and for the easiness of the styling, this haircut is the most popular in America. The hair on the top has length with the sides and the back cut short. A longer crown with the sides clipper faded is the trendiest hairstyle that ranks as the top hairstyle in America. Here are 10 short hairstyles that are already creating a buzz across the nation. The Hybrid hairstyle is one of the long top short sides haircuts that has a more practical approach, just like the one at the ‘salon’. Volume, texture, and fades in the lower areas make this style a clean one, a popular hairstyle. This pompadour haircut is for those who would like a gentleman’s hairstyle. The hair on the sides is cut short, while the long hair on the top adds to the style with a well-groomed beard. The hair on the top is cut to such length that is just below the crown. This is one of the most requested haircuts in America, where the long hair on the top is styled with a side part, which provides a professional look. The sides are cut short and will need the skills of a professional barber. This is a popular haircut for men having long and thick hair. The styled short sides, neat cut at the back and long hair on the top with the sectioned spikes makes this hairstyle trendy. While the drop fade on the sides mixes into the skin, an arc is formed along the top region of the ears. Well groomed thick hair at the top combed to one side creates a striking contrast to this popular hairstyle for men. The long hair on the top is blonde and brushed back. The sides are cut short and the sideburns join the breadline to give this long top short sides hairstyle a classy look. A styling product is necessary to keep the hair on the top in shape. 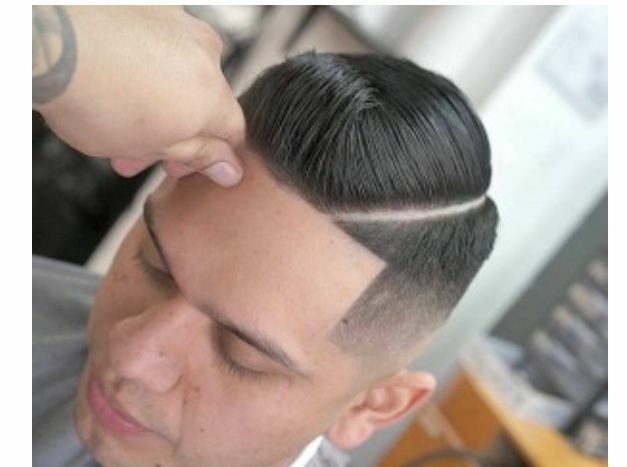 This haircut will need the skills of a barber for cutting the hair to a fade that is blurry with a cool pomp and tight corners. The hard part is styled on the top which is slicked to the sides and back. The short sides make it a contrasting hairstyle. 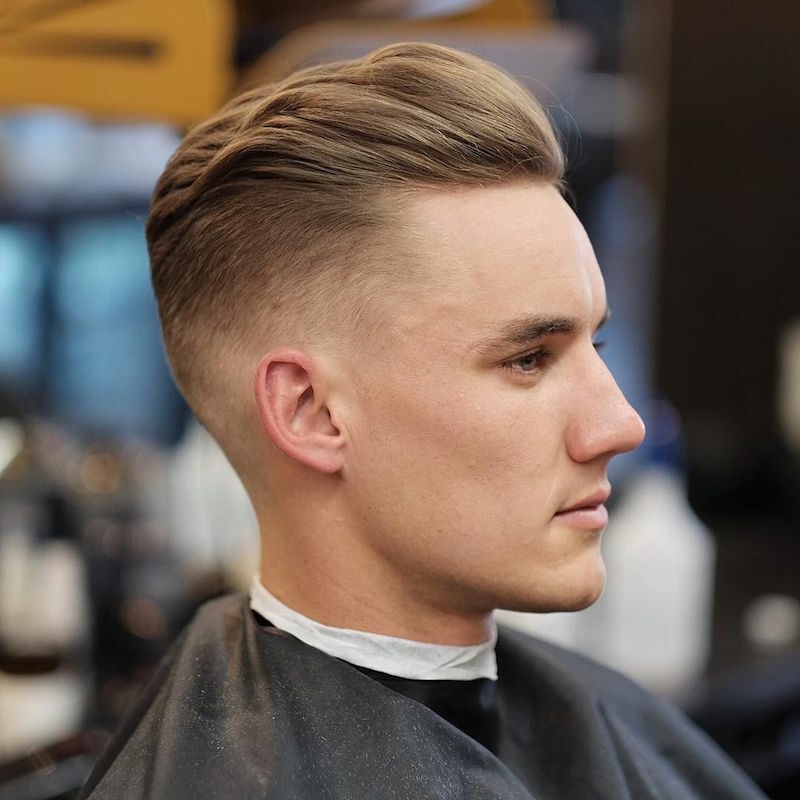 A neatly combed voluminous hair on the top, with the back and the sides neatly trimmed, is what this most popular hair trends for guys in America. The hair is of medium length and looks clean and elegant. This is one of the long top short sides haircuts that resemble a brushed back long hairstyle. This short pompadour needs minimum effort, where the hair is cut short on the top and the sides kept clean. A razor is used for the fade cut. It is easy to comb the hair and you can slick the hair on the top to the side. Volume is added to the long hair using a product and a blow dryer and then slicked back with a comb. The sides are skin faded using clippers and a gel is used for coating the blond hair for getting a hold onto the shape. This short sides long top haircut is also popular for being a low maintenance hairstyle.